Several year ago I was in Montezuma photographing a wedding at the Ylang Ylang beach Resort. That night walking back along the beach after the ceremony, I was amazed be the phosphorescence in the water. This weekend, again I was walking back after a wedding at Ylang Ylang and looking out to the ocean I could see an incredible phosphorescent light show in the water. I stopped for about an hour playing with my camera and taking some amazing long exposure photos. Even as I stepped in the waves I could see the phosphorescence sparkling around my feet in the wet sand, it was a magical photo session. The first photo is a 3 1/2 minute Exposure, I love the movement of the water around the rocks, it gives a really ghostly appearance. The second photo was a 7 minutes exposure. The streaks in the sky are the star moving and the lights on the water are fishing boats in the distance. I am proud to say that this photo was selected by the National Geographic to be their lead image in their weekly space gallery! Why does this magic light show occur? 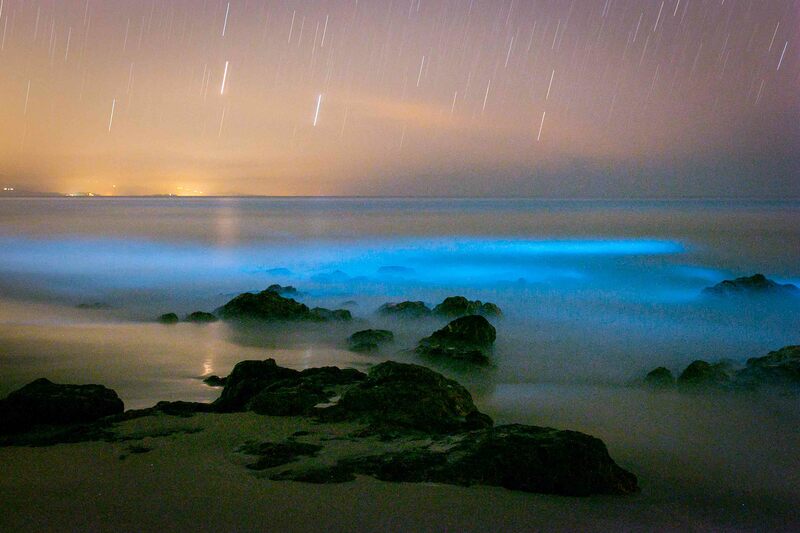 Certain types of oceanic plankton produce a phosphorescence in a chemical response to the energy produced by the waves movement. 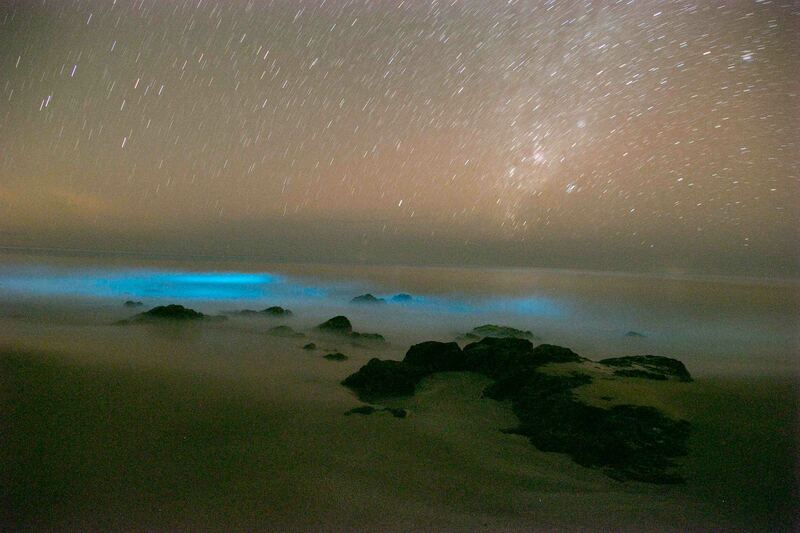 If you would like to see the 2012 of the phosphorescence go to Costa Rica’s Phosphorescent Waves . The photo from 2012 was selected for National Geographic’s Daily Dozen you can compare both photos from 2012 and 2014 on my NatGeo site. This entry was posted in Nature Photography, Photography in Costa Rica, Travel Photography and tagged Central America, costa rica, costa rica photography, John Williamson, John Williamson Photography, montezuma, nature photography, Pacific Coast, phosphorescence, phosphorescent waves, photography costa rica, waves. Bookmark the permalink. Awesome! I especially like the 2nd pic, it’s magical.